Locality: Sandport. It is coloured as earth with, many shiny dots covering the brown-grey. 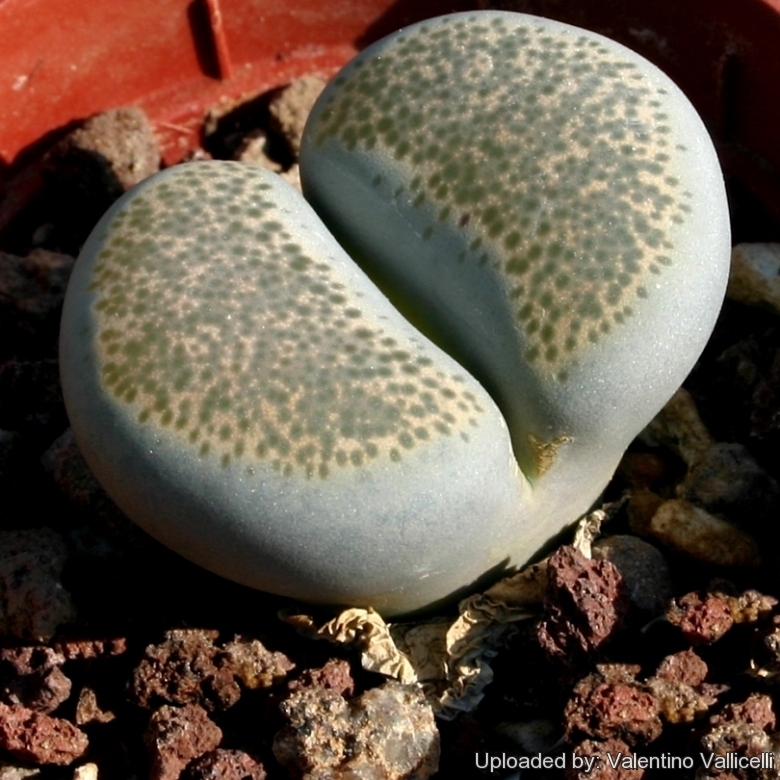 Origin and Habitat: Lithops localis (= L. terricolor) is the the most widely distributed species in the southern part of the lower Great Karoo, from Laingsburg, Northern Cape province, to Steytlerville, Eastern Cape Province, South Africa. Habitat: It is found under small shrubs ans stones on gravelly plains and flats. Substrata mainly composed by shale, weathered fine-grained feldspathic sandstone, quartzite, quartz-ite with fine-grained sandstone, siltstone, banded cherts and jasper. Colur of the background dark grey, grey-brown, grey-white, yellow-brown, brown, red, pink, white and black. They closely resemble the surrounding pebbles of their natural habitat, either in coloration and shape, this camouflage allows them to escape detection and is a very effective strategy for escaping predation. They are pollinated by bees, flies, wasps, gnats, bugs and other insects that are common in the area.